*Note 1: Many designers are accustomed to linear foot boardwalk pricing with standard boardwalk section widths of 6’, 8’ or 10’. Depending on the site and project requirements, the width of a PermaTrak concrete boardwalk can vary anywhere from 3’-9’’ to 15’-4’’. 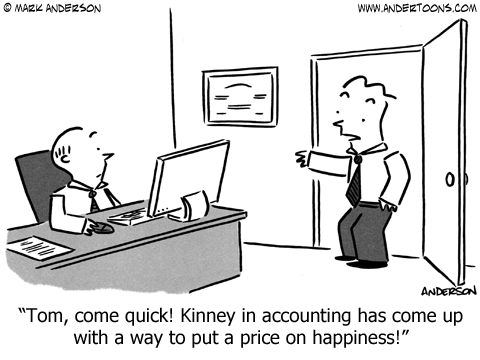 For this reason, we typically share boardwalk construction cost estimates per square foot (SF). *Note 2: You'll notice that as the usable space (boardwalk width) increases, our boardwalk cost per SF will seem more attractive. In many cases, the same foundation system is constructed, whether the boardwalk is 6' wide or 15' wide. 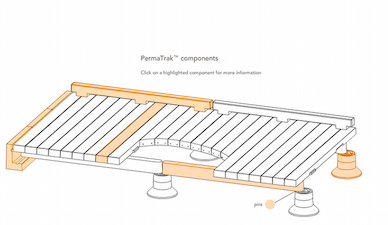 In other words, PermaTrak's boardwalk system will likely have the same substructure no matter the width. This is not the case on all projects. *Note 3: You’ll notice that the PermaTrak concrete boardwalk system installed on each of these foundation options is shown with a price range. Why is there such a large range in pricing? One reason is that after running thousands of budget estimates over the last several years, we’ve found there to be a variance in labor rates by region. Southern states such as Florida generally have lower labor rates than states in the Northeast, for example. Another reason for price ranges by SF is that miscellaneous material rates will vary by region. Perhaps there is a steel pile producer down the street from your project site, so steel piles are cheaper for your project. Lastly, depending on where your boardwalk project site is, shipping rates will impact the project’s overall cost. For starters, boardwalk construction numbers will vary with different applications. As we say, “No two sites are the same.” One of the first steps in a boardwalk project’s design document phase is determining which foundation type will provide the most value within the owner’s allotted budget. 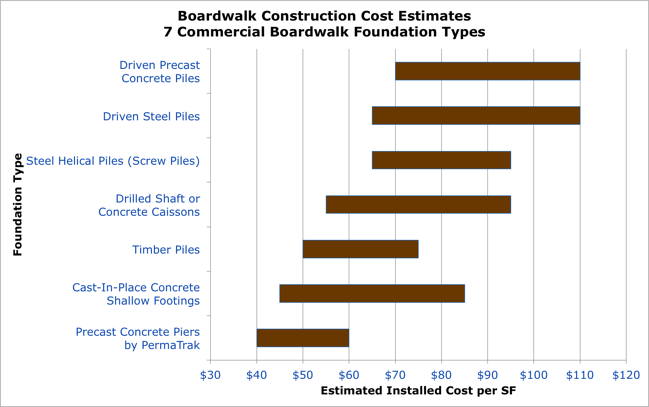 For this reason, this article will share cost estimates for a PermaTrak boardwalk installed on seven different foundation options. Professional designers have plenty of options between timber, concrete or steel materials in specifying a boardwalk system’s foundation type. 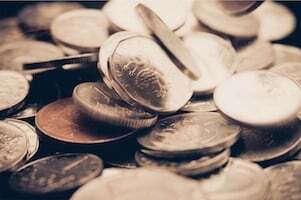 The crucial question becomes - “How much does each foundation type COST?” Foundation costs are significant drivers of overall project costs as specified materials, construction methods and design requirements vary widely. The boardwalk cost estimates and foundation types presented below include rough ballpark figures, based on the projects we’ve been involved with since starting PermaTrak in January 2010. If you are looking to gather a project-specific boardwalk budget estimate, we encourage you to finish reading the information presented here, then click the button below to request a boardwalk budget estimate. We will do our best to provide a detailed boardwalk construction cost estimate, specific to your location and project needs. These installed boardwalk price ranges assume a pedestrian loading of 90 psf. Railings are excluded; you can learn more about boardwalk railings here. A boardwalk system like PermaTrak may also be a great fit for heavier live load requirements, including a 5,000 lb. maintenance vehicle (Gator), H5 truck (10,000 lb. vehicle), H10 truck (20,000 lb. vehicle) or higher. You can read more about these requirements and other boardwalk design considerations here. Lastly, we are assuming a geotechnical report has been completed; this report will drive the foundation design process. These stackable pier components serve as a shallow foundation (spread footing) type of foundation. If feasible, we recommend using this precast concrete pier system; it is the most cost-effective foundation option for a commercial boardwalk. The piers are supplied as part of the PermaTrak system. PermaTrak boardwalks installed on this precast concrete pier system typically range from $40-60/SF. 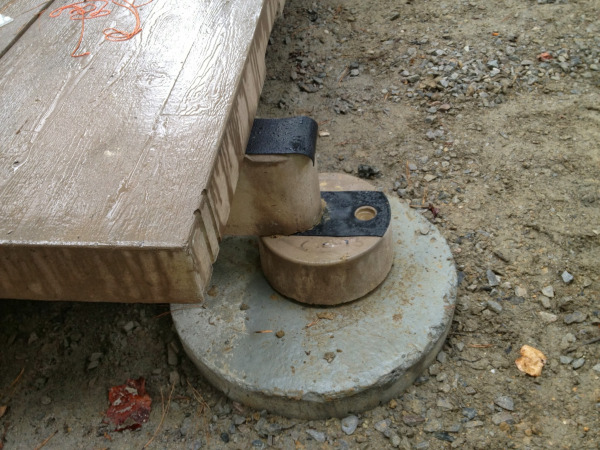 This installed number includes boardwalk engineering and design support, material (foundation system, beams and treads) delivered to the site, and labor to install the product. Shallow footings (#1-2) are preferred over deep footing options (#3-6) as they contribute to a lower boardwalk construction cost. Primarily due to their cost-effectiveness, pressure treated timber piles (aka timber poles) are the most common deep foundation option for commercial boardwalks. 12’’ diameter widths are often specified, while total pile length can be anywhere from 10’ – 40’. Several variables will impact the price of timber pile installation: site access, diameter of pile required, required driven depth, geographic region, total number of piles, soil conditions, etc. Although these piles are supplied and installed by the contractor, we use historical data to estimate the total installation costs. Generally a PermaTrak boardwalk installed on a timber pile foundation will cost anywhere from $50-75/SF. 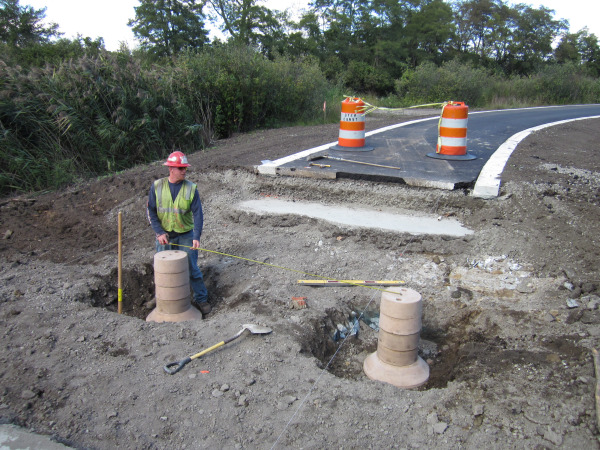 In northeastern states like Connecticut or Massachusetts, PermaTrak has been installed on a reinforced, concrete caisson. In Texas, drilled shaft foundations are common because of the expansive clay soils. This drilled shaft or concrete caisson method serves as a deep foundation option. 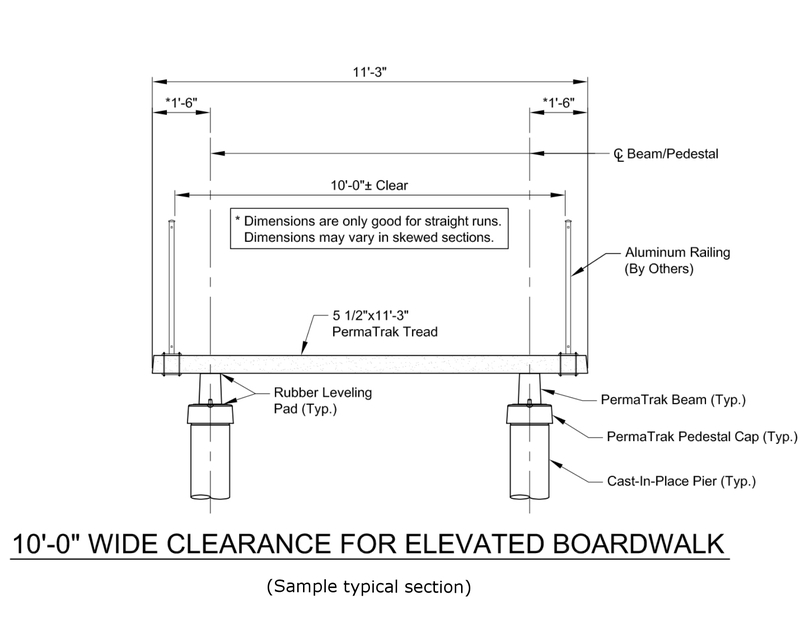 Most PermaTrak boardwalks installed on a cast-in-place caisson system (deep foundation) cost $55-95/SF. When designing a boardwalk on cast-in-place caissons, designers will consider site conditions, industry standard casing sizes, and finished boardwalk elevation (height above grade). All of these factors influence the structural engineer’s design for diameter and depth of the caissons. The photo here a multi-use path project shows a walking surface at roughly 5-6’ above grade. 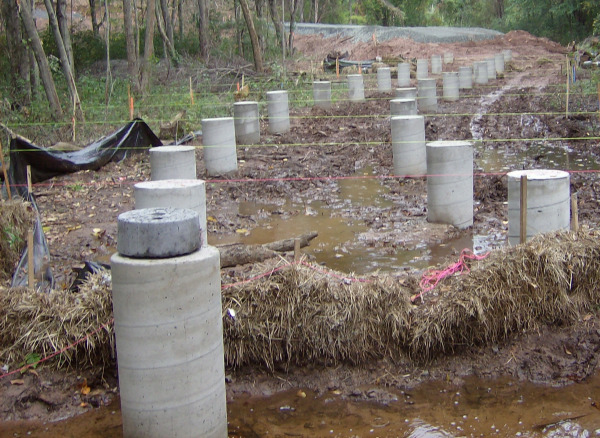 Steel helical piles, sometimes referred to as screw piles, are much less common than options #3-4 as a deep foundation option, but they may provide several distinct advantages over timber or concrete foundations for your project site. 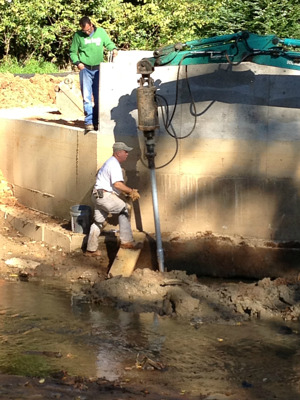 Increasing in popularity and recognition, more designers are looking to helical piles as an environmentally friendly foundation option, especially if the boardwalk or pedestrian bridge needs to be installed in a sensitive wetland, or via top down construction. Depending on the required diameter of the central steel shaft, and number and size of attached helices, a PermaTrak boardwalk system installed on a steel helical pile foundation will typically cost $65-95/SF. See an example of a PermaTrak project installed on helical piles here. Other types of steel piles are less common for boardwalks and pedestrian bridges. They may, however, serve as a durable deep foundation option if the project’s budget allows. 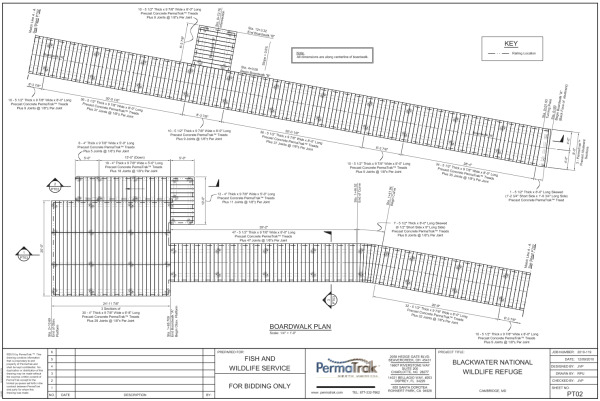 Depending on pile size and required driven depth, a PermaTrak boardwalk system installed on a driven steel pile foundation will typically cost $65-110/SF. Less common than options #1-5, precast concrete piles offer durability and longevity as a deep foundation system. 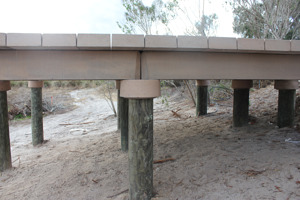 An installed boardwalk cost range for the PermaTrak system on a driven, precast concrete pile foundation is $70-110/SF. Detailed construction documents and shop drawings submitted by a registered P.E. You can read an article with more information on what this engineering support includes. Other recent projects have shown this same result: a concrete boardwalk costs less than a timber boardwalk. How can this be possible? The answer is that PermaTrak's precast concrete beams can span at least twice the length of a timber stringer or "runner". Installed costs can vary widely by project and longer spans don't always make for the best design option. But for the boardwalk projects where longer beams are feasible, fewer footings are required. We know that foundation installation costs can be a significant piece of the total boardwalk construction cost. Fewer footings saves time and material = cost savings. Learn more about this potential cost savings for your project here. Hopefully this boardwalk square foot pricing information is helpful for your preliminary budget estimating purposes. But keep in mind, these installed price ranges are meant to be “ballpark” numbers. I’ve made multiple assumptions relative to soil conditions, site access, live load requirements, etc. that need to be designed and verified by a professional engineer. 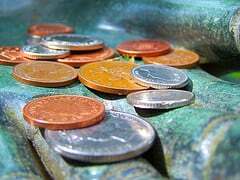 Feel free to request a more specific budget estimate by clicking here, or give us a call and we will do our best to help with more technical information on the foundations described above. We understand how much work goes into the evaluation process for commercial boardwalk materials: initial costs, the owner’s experience with other materials, constructability, associated maintenance costs, etc. Hopefully this information is helpful as your project develops into design and construction documents. Editor's note: This post was originally published in November 2013 and has been updated for accuracy and comprehensiveness.